If you say you are a designer or a fashion enthusiast and you are not creative with any piece of material or clothe that comes your way, then something must be wrong. Check out this Gele stylish tied in a Micky Mouse pattern. 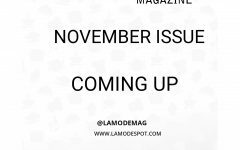 LA MODE MAGAZINE NOVEMBER ISSUE COMING UP! Relationship Goals: Kris Jenner and Cory Gamble!